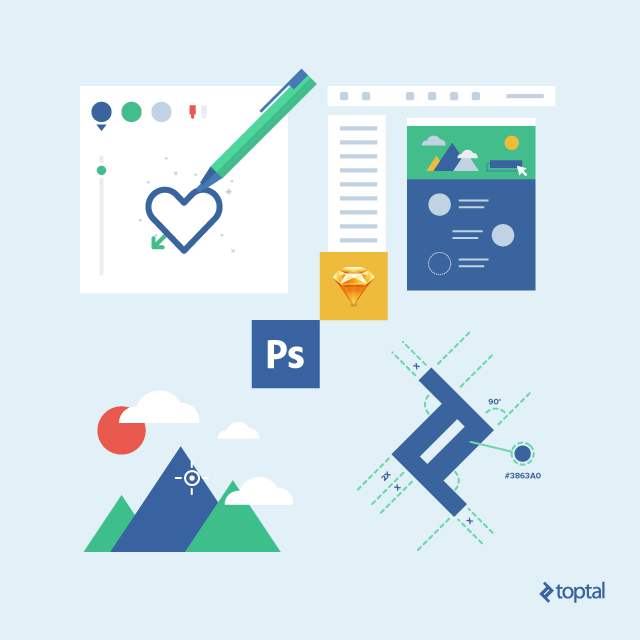 Toptal is a private network of the top 3% of Photoshop designers from around the world. Browse top Photoshop design portfolios and hire Toptal freelance Photoshop designers for your most important projects. Check out some of our top Photoshop designers. Hire a top Photoshop expert now. Toptal is a marketplace for top Photoshop experts. Top companies and start-ups choose Toptal Web designers for their mission-critical design projects. Both Sketch and Photoshop are great tools used by almost every designer to accomplish a huge variety of tasks. To Photoshop has even become a dictionary verb. It doesn’t come as a surprise that most clients will expect a designer to have a high level of Sketch and Photoshop expertise. The majority of Toptal design jobs have either Sketch or Photoshop listed as one of their main required software. All of this is probably making you want to demonstrate your Sketch and Photoshop mastery throughout your portfolio. Before proceeding, keep in mind that both Sketch and Photoshop are just tools and although tools do not make great designers, being a master of the tool gives the ability to execute your ideas professionally and efficiently. So, how do you showcase that you are a Sketch or Photoshop expert in your portfolio? It mostly depends on the kind of design work you mainly use either program for. If the focus of your design work is in the creation of visuals, illustration, photo manipulation and photo editing in Photoshop, you’ll want that to shine from your portfolio. When deciding which projects to showcase in the portfolio be sure to choose only your best work and try not to be repetitive. There might be some clients that fall in love with your unique style but often clients prefer designers who can adapt to different styles and trends. Choose work that demonstrates your mastery in detailed visual compositions, combining various layers, masks and advanced blending and some other qualities that demonstrate your proficiency with using light and shadow. Show that you understand perspective. Include an example that illustrates how immaculately you manage colors. In addition to showing complete visuals or illustrations put some emphasis on perfectly crafted details and make a few close-ups of the most interesting details that really demonstrate your perfection. Share your work process in the portfolio, give some sketches, display how raw materials looked like and what you’ve accomplished to make out of them. If it’s appropriate to showcase photo editing skills, put in some before and after the visuals. While developing the visual identity as a part of a branding project you preferably won’t use Photoshop as your main tool of choice but one of the vector tools such as Illustrator. However, Photoshop will come in handy to visualize how that identity (logo, chosen colors palette, and typography) will work and look on stationary, signage, visual identity guidelines, website, apps and other additional advertising materials. To showcase your branding project at its best, the first step you’ll need to do is to find or make some 3D mockup templates. Be careful to choose ones that won’t interfere with work that you are primarily showing, but instead, choose ones that will put emphasis on its best features. Avoid weird perspectives, too many distractions in the form of surrounding objects, colors, patterns. Remember that you are showcasing your branding capabilities to prospective clients and not trying to sell them good looking mockups, especially if you haven’t made them by yourself. If you are buying or using some free templates be sure they are of quality. When applying your work inside a mockup, give attention to details, align everything perfectly, take care that there are no pixels hanging around. Double check that you are putting your pages or screens in the right perspective, that lighting, white balance and shades are all adjusted and that nothing looks pixelated or distorted. Keep in mind that the scene you are building must look like a real one and although it might not be noticed at the first glance some inconsistencies could signify to a potential client that you are not giving enough attention to details or that you are not so versed in Photoshop. Photoshop was not developed for web and user interface visual design, but since no completely corresponding tool existed at the time, most web designers were using it as their primary tool. With the adoption of responsive design and the arrival of more appropriate tools and workflows developed specifically for web and user interface design, Photoshop lost its web design tool throne. There are still some designers, especially those not working on Macs that use Photoshop, but Sketch is now the leader in the field. If you are working as a web or user interface designer, no matter which tool you use you’ll want to show your proficiency and effectiveness in it and that could hardly be accomplished without revealing your process. High-quality visuals can be produced even if you are not a master of your tools, but glancing through your work files and workflow can show potential clients and collaborators that you are one. That is the reason for showing and describing in your portfolio how you use grids, artboards, structure your layers, and deal with Sketch symbols or Adobe CC libraries, handle typography and styles. Show some close-ups that will place emphasis on your attention to detail. If you craft your pixel-perfect icons and other elements in Sketch, display them with pride. When choosing mockups in which to present web design or UI work stick with ones that won’t interfere with your designs. Let them be clear, without any unnecessary clutter. If using 3D perspective views, be sure that your work, which is core content of your portfolio, is shown in a way all important components are visible and understandable and there are no perspective distortions. If you claim to be a Sketch or Photoshop expert, be sure that all your portfolio projects and presentations look professional. Some minor details, like the wrong direction of a shadow, or any pixelation might show a well-trained eye that your design skills are weak or that you lack the ability to polish your projects up to the last detail. Be sure that all pictures you are putting in a portfolio are sharp and that nothing is pixelated, posterized or distorted. All elements in photomontages should blend seamlessly, and perspectives of different elements must be aligned and lighting effects, shadows and white balance in compliance. Remember also that although the presentation of projects in your portfolio is very important, and can be a good means of showing your Photoshop skills, don’t let it become more important than the work itself. If by looking at your portfolio, one is more aware of the presentation than the content, be sure that something went wrong and reconsider rebuilding the portfolio around your best projects.